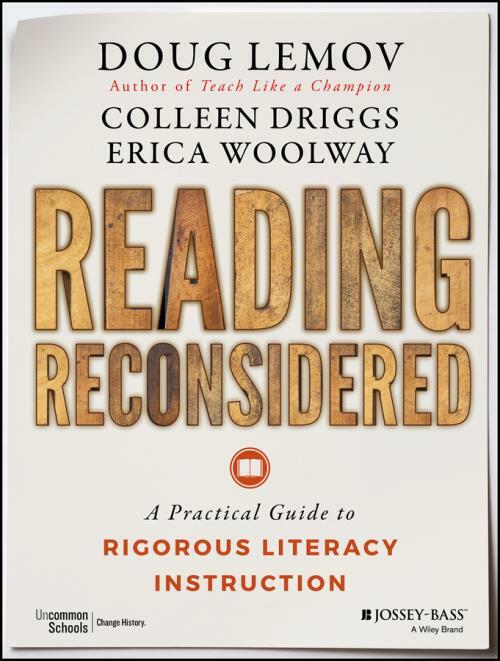 In Reading Reconsidered, Doug Lemov, author of the groundbreaking Teach Like a Champion, and his coauthors, Colleen Driggs and Erica Woolway, reveal the most productive ideas gleaned from the most effective teachers of reading. This book takes you into the trenches with actionable guidance from real–life educators and instructional champions. The authors address the anxiety–inducing world of Common Core State Standards, distilling from those standards four key ideas that help hone teaching practices both generally and in preparation for assessments. This "Core of the Core" shows how to teach students to: read harder texts, closely read texts rigorously and intentionally, read nonfiction more effectively, and write more effectively in direct response to texts. The authors also focus on the "fundamentals" of reading instructiontechniques and subject specific tools that reconsider approaches to such essential topics as vocabulary, interactive reading, and student autonomy. Filled with practical tools and over 40 video clips from real classrooms, this book provides the framework we need to ensure our students forge futures as lifelong readers. "Teaching children to read is our most challenging task in education. This book is a ′must–read′ for K12 educators trying to crack this very tough nut!" "Reading Reconsidered provokes us into thinking in new ways about that most foundational of academic skills: making sense of the written word. The authors offer a fresh perspective on reading that is both intellectually stimulating and relentlessly practical."